Allow me a brief review of a movie ... The Theory of Everything ... four stars. Eddie Redmayne's Oscar for his portrayal of Stephen Hawking is well deserved. Should you not be familiar with the subject matter: Stephen Hawking is the former Lucasian Professor of Mathematics at the University of Cambridge, and the author of A Brief History of Time. Anyway, this blog is not about the movie. However, if you’re tempted to buy the book, be sure to get the illustrated edition ... it’s beautiful. The (content of) the book is mindblowing. Quite literally. The magazine Popular Science reviewed it thus: "It's one of a very few books ... that continues to fascinate despite the fact that much of its contents stretch the reader further than is usually expected in a book ..."
Ten million copies have been sold; mind you, it is said at most ten percent of readers understand what it’s about (and that doesn’t include me) and even a lot less have actually finished reading it. But this is the thing ... one reviewer said: "This book is a must read for anyone who has crossed the boundary of general inquisitiveness at sometime in their life to seek ... the future journey to the world of knowledge." Still, this blog is not about that book either, nor even about Prof. Stephen Hawking, though (and this is what this blog is about) it is one of the books that contributed to my awakening, and while I may not understand what Mr. Hawking is talking about (who does?) ... he has with his work helped me paint my own picture of the world. ... but when he explained in the book (and one of his tv series) how the universe did materialise from nothing (or at least could very well have materialised from nothing) with the help of quantum physics and gravity, something clicked for me. There is this question from the religiously inclined, who ask, "well ... then what was there before there was anything ... i.e. before the big bang?" Their answer is: God. Hawking's answer is: Gravity; or a Cosmic Law. Gravity = God; geddit?! So there ... now move on, you religious types. In any case, this sparked a sparkling spark in me. That spark is my very own TOE (Theory Of Everything). Nothing less. 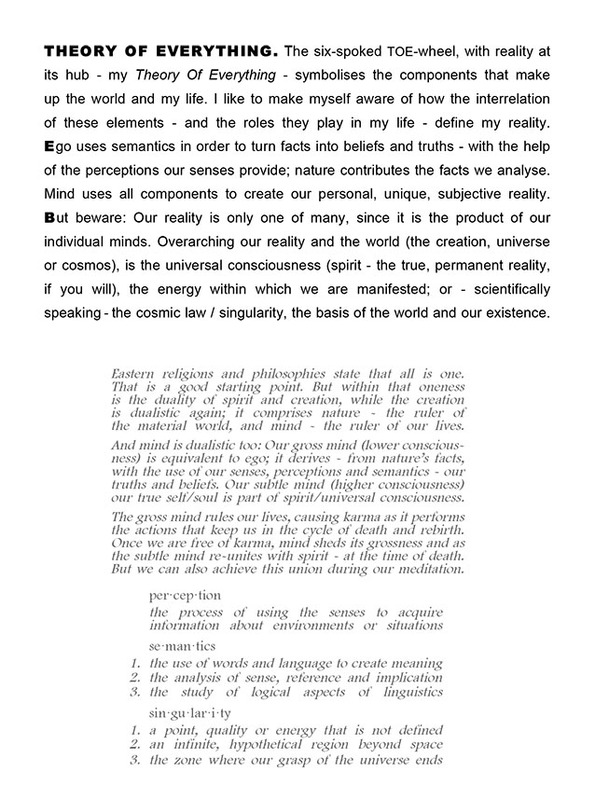 To be frank, I had written my essay years ago, before learning from Prof. Hawking about quantum physics, gravity and - by extension - universal consciousness. On the tiniest of tiny levels matter is nothing but energy ... indeed, all is energy. What we perceive as matter are particles of energy roaming about in space ... in fact, there's an awful lot of space and not very much of particles. And guess what, these particles, on a sub-atomic (quantum) level, bounce into one another and either disappear, and/or other particles appear. Into and out of ... nothing (at the point of a singularity; or [on a cosmic scale] a black hole). So, that very thing could well have happened at the beginning of our universe. Easy, isn't it?! Not shocking at all ... which means I haven't a clue of what I'm talking about. Other than ... I think this is sooo beautiful ... it must be true. ... how I compute the relationships of Nothing, Quantum Physics, Gravity, The World and God (or Spirit, Universal [or Higher] Consciousness), by way of how my personal reality is created with the input of what I observe in nature (through the sciences) ... with taking into account my perceptions and beliefs, my own thruths and my ego ... all of which are a part of the material world, the creation, cosmos, space, universe ... which in turn is contained in a larger (a truly infinite) realm (Spirit; the All; the One). The overarching reality is that there is what Stephen Hawking recognises as the cosmic law (manifesting as gravity), or a singularity ... 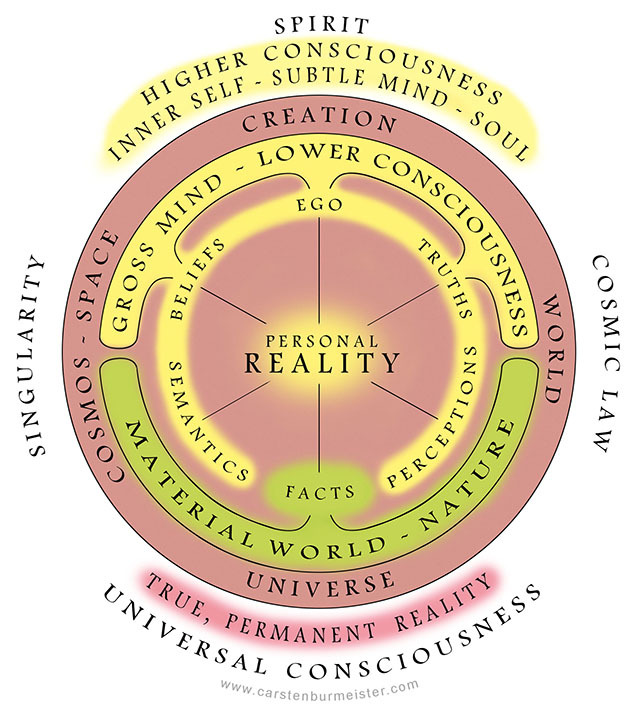 I reckon it is the universal consciousness (... to which my own consciousness relates like a drop to the ocean); the difference is that Hawking's reality is purely scientific ... whereas mine is both scientific as well as spiritual, i.e. relating to spirituality (while eschewing religion). I identify my consciousness as the heart of the universe ... what is the centre of the universe? It is my (or your) mind. From where I stand it is my consciousness ... from where you stand the heart of the universe is your consciousness ... in the big picture the heart of the universe is universal or higher consciousness. I believe that universal consciousness is where we all come together as one; or if you will, as One. It is on that level that humans are immortal; we live forever. It is for that reason that our loved ones live in our heart (our soul, our inner, true self, our consciousness) ... either when they're away or once they die (I feel that way about my parents, my wife, children and grandchildren [in no specific order] and, by extension, about humanity). In this sense we see consciousness as love. All is one, is consciousness, is love; indivividual consciousness encompasses family and friends (our loved ones) ... universal consciousness denotes humanity as one; humans are one (and equal). Right. Am I founding my own religion here? Of course I am. Who can join? Anybody; anybody who pays me ten thousand dollars ... no refunds if you change your mind. Did you see the movie Going Clear? About Scientology? Awesome. So cool. Scientology is a totally brilliant business model ... if they can do it, so can I.